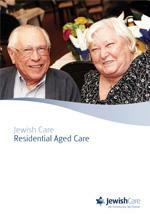 Smorgon Family Nursing Home provides traditional accommodation for people with high care needs. At Jewish Care, we understand how important tradition and heritage are to our residents and provide a warm, heimish (homely), culturally-sensitive environment for the time of your life where you are seeking rest, peace, and relaxation. In addition to continuous residential care, we also offer residential respite at Smorgon Family Nursing Home to enable carers to take a break from caring, and in times of rest and recovery. Our aim is to provide a supportive, safe and secure home with cost-effective and continuous supported care for all of our Elders. At Smorgon Family Nursing Home, our caring and compassionate staff take the time to understand what's important to each individual Elder to ensure you receive the highest quality care for your unique needs. Your cultural and spiritual needs, level of care, and your health and medical requirements are important to us. Medical help and support is always on hand at Smorgon Family Nursing Home. Our 24-hour traditional high care ensures your health, wellbeing your safety is assured. Smorgon Family Nursing Home is the perfect place for rest, peace, and relaxation. With a range of great daily activities, you'll never be bored or lonely. Selected with your preferences and wellbeing needs in mind, our daily program of activities includes music, art, exercise, aromatherapy, entertainment, concerts and regular outings. Situated in Melbourne by the leafy landscape of St Kilda Road and close to public transport and the community, Smorgon Family Nursing Home provides cost effective, 24-hour Traditional high care for permanent or short-term respite services. Our central location enables family and friends to be close by. We warmly welcome and encourage families to become part of the Smorgon Family community. We understand the importance of tradition and heritage to Elders and their families. The customs that you hold dear continue to be a central part of your life, and our regular activities create strong family and community ties, bringing you, your loved ones and the broader Jewish community together. We understand that you want the highest-quality, culturally-sensitive, personalised care for you or your loved one. We invite you to take a personal tour of Smorgon Family Nursing Home. For more information about Smorgon Family Nursing Home or to book your personal tour, contact our Front Door on (03) 8517 5999 or submit an online enquiry.